Check out the Bombshell Stamps Blog Hop this month.... The theme is "Textures and Layers!" We want to see lots of funky textures, and plenty of layers! I used Sacred Heart and Banner Sayings for my images, colored in Copics. 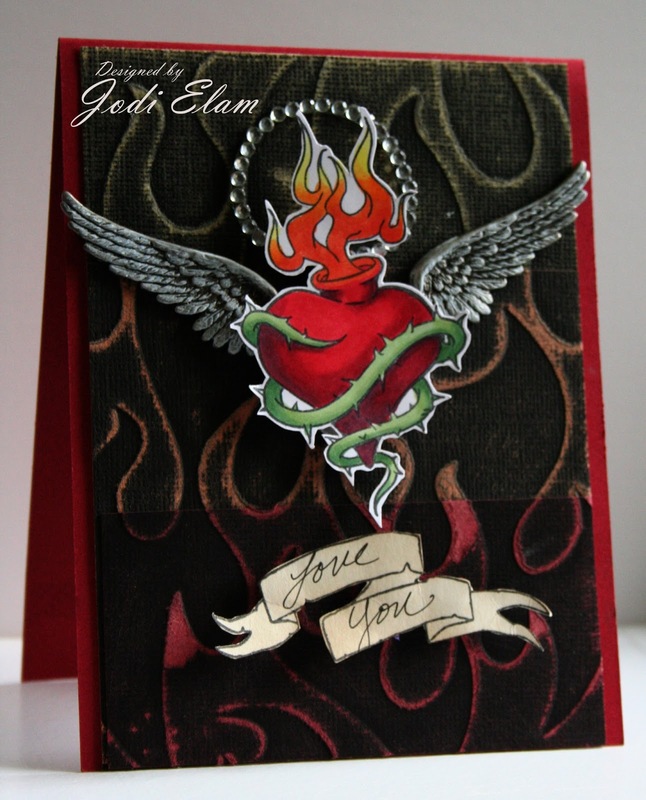 The background flames are several layers of different colored Black Magic Core'dinations cardstock embossed with a flame embossing folder by Darice, then sanded.. The metal wings are Tim Holtz for Ideaology which I went over with a bit of white ink to highlight. There's little bit of everything there - lots of layers and textures! So, you want a chance to win a prize?? Hop along with us! Visit all our fabulous hoppers and make sure you leave some Bombshell love! This is super cool love the flames! Ack! I NEED that embossing folder! I haven't seen that one! I love that you have used different Black Magic papers to get the effect. Love those wings too. Beautiful card Jodi. I love the embossed flame background and your colored image! The rhinestone halo and the wings are awesome too. Fabulous card! I love how you've put the wings behind the heart,that looks great! Fabulous card! I love that image and it's colored beautiful! Thanks for joining us at Crafty Calender this month! This is gorgeous! I really love the way you colored the heart. The addition of white paint to the wings really make them pop. 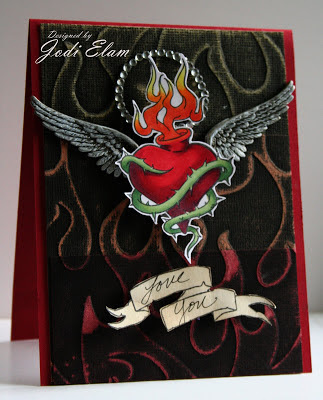 I also really, really love that flames embossing folder. I'll have to hit up my AC Moore to see if they have it! Your elements came together for a fantastic card! Love how you used that embossing folder! I've seen that and wondered how to use it. Thanks very much for allowing your creativity to take WINGS with us at Opus Gluei! What a stunning card Jodi ! Great Bombshell image.